In continuing our thorough examination this week of Bruce Springsteen parodies in 1980s pop culture, here we see a shot from the classic Jem episode ""In Search of The Stolen Album". I assume it is a classic, I actually haven't seen it. 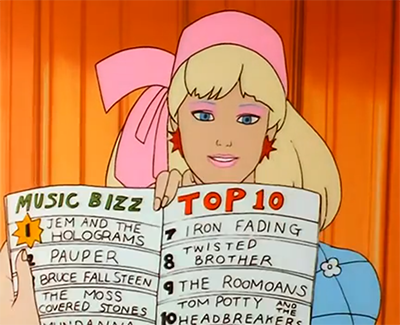 However, as you can see, a musician named "Bruce Fallsteen" is number three on the charts. In case you didn't realize, that is supposed to be Bruce Springsteen, but they changed it from "Spring" to "Fall" because fall is the opposite of spring when it comes to the seasons of the year. If you need further help understanding the joke, please let me know in the comments section below. That's it for this Great Moment In Springsteen Television History. Bruce Fallsteen does not appear anywhere else in the episode; in fact, the Great Moment is entirely captured in the screenshot above. Was this a waste of time? Perhaps. But check out those other parody band names: The Moss Covered Stones! The Roomoans! Tom Potty! As always, Jem is truly outrageous. Lyric's Spotlight: "Gave It A Name"
7Lions - "Born 2 Run"